A 22-year-old Indian male presented to us with 18 months history of severe otalgia right side and serosanguinous persistent otorrhoea of 6 months duration which was treated at various private clinics as otits externa with topical antibiotic, antifungal, anti-inflammatory preparations including systemic antibiotics without any resolution. He also gave history of reduced hearing on right ear as compared to left. There was no history of tinnitus, vertigo, facial weekness, aspiration, radiation exposure or alcohol or tobacco abuse. 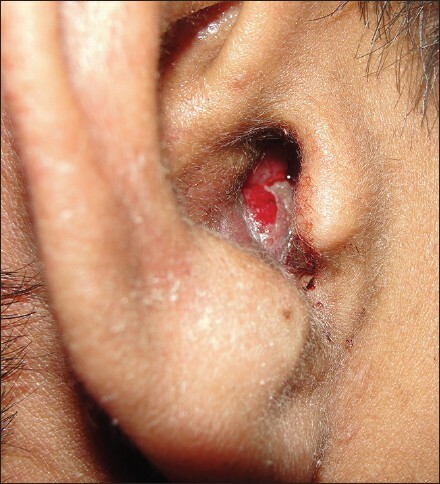 On examination there was a granulomatous mass [Figure 1] occluding the complete external auditory canal (EAC) involving all the walls of EAC and was friable with bleeding on touch. He had moderate conductive hearing loss without any cranial nerve weekness or loss of sensation. A computed tomography (CT) scan of temporal bones and ear revealed opacification of his right EAC with bony destructive changes of all walls incuding middle ear spaces [Figure 2]. Due to his persistent symptoms and bony destruction the mass was biopsied which showed a well differentiated SCC characterized by sheets of cells with large cells with pleomorphic, hyperchromatic nuclei and individual cell keratinization, and keratin pearl formation. This patient was refered to oncology center where he underwent partial temporal bone resection followed by post-operative full dose radiotherapy. This patient is disease free till today about 1 year following treatment however the sequel of surgery and radiotherapy in form of facial paralysis persists for which he is being rehabilitated. SCC of EAC and temporal bone is a very rare tumour with an annual incidence of 1-6 cases per million and constitute about 0.2% tumours of head and neck. This is a disease of elderly most commonly in seventh decade of life. The main etiology factor for SCC of the temporal bone and EAC is a long standing chronic otitis media for more than 20-25 years duration and this was explaining the mean age of presentation in elderly however our case presented in second decade of life with a mass without any history of otorhoea. The other risk factors are chronic dermatitis, choleasteatoma, history of irradiation and occupation like radium dial painter. ,,,, None of these risk factors were present in our patient. T1 is tumor limited to the external auditory meatus without bone or soft tissue extension. T2 is tumor with limited bone and soft tissue extension. T3 is full-thickness external auditory meatus erosion, middle ear or mastoid extension, and facial nerve paralysis. T4 is tumor eroding the cochlea, carotid canal, jugular foramen, dura, petrous apex, or extensive (>0.5 cm) soft tissue extension. Nodal and metastatic disease staging same as other head and neck cancers. Treatment of squamous carcinoma of EAC depends on the extent of disease both locoregionally and lymph node metastasis. The aim of the treatment is en bloc surgical resection with tumour free cut margins and post-operative chemo radiotherapy. Most commonly performed surgery lateral temporal bone resection for tumours limited to EAC a post-auricular approach. The steps involved are complete mastoidectomy with extended facial recess continuing anteriorly till root of zygoma. Incudostapedial joint is separated and incus removed; bone anterior to tympanic annulus and vertical facial is removed till stylomastoid foramen; parotidectomy along with neck dissection is performed and specimen released with a bone cut lateral to styloid process. The defect is closed using abdominal fat. Subtotal temporal bone resection is indicated for tumours involving middle ear and mastoid. This includes removal of entire pinna and temporal bone lateral to intracranial artery calcification and carotid artery. The defect is closed using rectus abdominus free flap or trapezius flap. Total temporal bone resection is indicated for T4 disease and includes removal of sigmoid sinus, petrous carotid artery, jugular bulb and the involved dura. Adjuvant radiotherapy is in doses of 60 Gy is used. Complications of surgery include haematoma, infection, cerebrospinal fluid (CSF) leak, injury to cranial nerves, stroke. These can be addressed by appropriate procedures like meticulous wound closure, primary closure of CSF leak, post-operative antibiotics, lumbar drain, thyroplasty and speech and swallowing therapy etc. Advance disease carries poor prognosis with 5 year survival ranging from 20% to 70% in various case series depending on the stage at presentation. The most common symptom for recurrence is pain and the palpable mass followed by bleeding and recent onset cranial nerve palsies. Malignant neoplasm of temporal bone are very rare leading to poor suspicion especially in young like in our case. This is due to more common diseases like otitis externa, cholesteatoma, aural polyp are suspected and treated accordingly. However, high degree of suspicion, early tissue biopsy and radio imaging are the key for detecting these malignancies in time and for better prognosis. This case also gives us an insight regarding possible etiology of SCC of EAC as genetic in contrary to the belief of chronic otitis and radiation exposure. 1. Morton RP, Stell PM, Derrick PP. Epidemiology of cancer of the middle ear cleft. Cancer 1984;53:1612-7. 2. Gillespie MB, Francis HW, Chee N, Eisele DW. 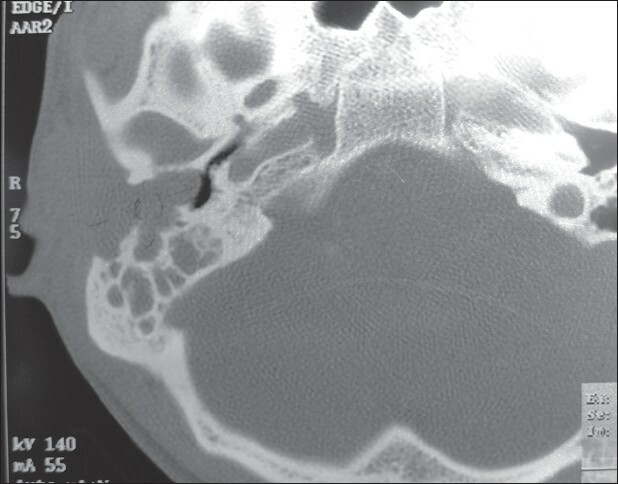 Squamous cell carcinoma of the temporal bone: A radiographic-pathologic correlation. Arch Otolaryngol Head Neck Surg 2001;127:803-7. 3. Leonetti JP, Smith PG, Kletzker GR, Izquierdo R. Invasion patterns of advanced temporal bone malignancies. Am J Otol 1996;17:438-42. 4. Pensak ML, Gleich LL, Gluckman JL, Shumrick KA. Temporal bone carcinoma: Contemporary perspectives in the skull base surgical era. Laryngoscope 1996;106:1234-7. 5. Nyrop M, Grøntved A. Cancer of the external auditory canal. Arch Otolaryngol Head Neck Surg 2002;128:834-7. 6. Kinney SE, Wood BG. Malignancies of the external ear canal and temporal bone: Surgical techniques and results. Laryngoscope 1987;97:158-64. 7. Moffat DA, Grey P, Ballagh RH, Hardy DG. Extended temporal bone resection for squamous cell carcinoma. Otolaryngol Head Neck Surg 1997;116:617-23. 8. Goh YH, Chong VF, Low WK. Temporal bone tumours in patients irradiated for nasopharyngeal neoplasm. J Laryngol Otol 1999;113:222-8. 9. Lustig LR, Jackler RK, Lanser MJ. Radiation-induced tumors of the temporal bone. Am J Otol 1997;18:230-5. 10. Monem SA, Moffat DA, Frampton MC. Carcinoma of the ear: A case report of a possible association with chlorinated disinfectants. J Laryngol Otol 1999;113:1004-7. 11. Conley J. Cancer of the middle ear. Ann Otol Rhinol Laryngol 1965;74:555-72. 12. Conley J, Schuller DE. Malignancies of the ear. Laryngoscope 1976;86:1147-63. 13. Coachman EH. Squamous cell carcinoma secondary to cholesteatoma. AMA Arch Otolaryngol 1951;54:187. 14. Beal DD, Lindsay JR, Ward PH. Radiation-induced carcinoma of the mastoid. Arch Otolaryngol 1965;81:9-16. 15. Ruben RJ, Thaler SU, Holzer N. Radiation induced carcinoma of the temporal bone. Laryngoscope 1977;87:1613-21. 16. Arriaga M, Curtin H, Takahashi H, Hirsch BE, Kamerer DB. Staging proposal for external auditory meatus carcinoma based on preoperative clinical examination and computed tomography findings. Ann Otol Rhinol Laryngol 1990;99:714-21.